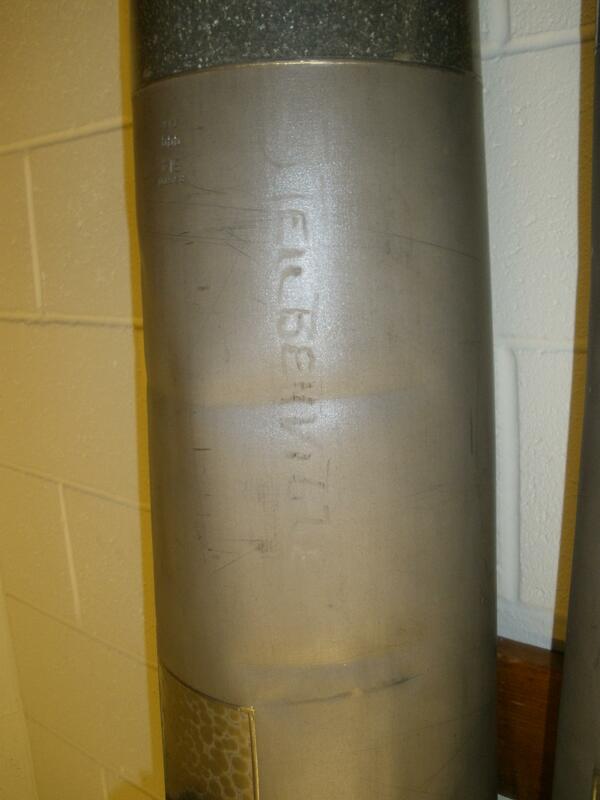 <== At left is the nameplate of our organ, showing its serial number 2872, although the model number is blank. The Capitol Theatre opened to the public on September 6, 1925. It was located at the corner of S. 4th and Adams Streets. It was constructed by the Tri-State Amusement Company, owners of the Olympic and Strand Theatres in Steubenville, as well as several other theatres in nearby East Liverpool, Ohio and Wheeling, W. Va. John K. Papulias is President, and Angelos G. Constant is Vice-President of the company, and are well-known in the Ohio Valley theatre industry. The Capitol Theatre is a large glazed white terra cotta structure, with large boulevard lights surrounding the building. The cost for construction is $700,000. Four shops and several offices share the building with the theatre. The building itself is 150' x 181' with the stage being 75' wide and 32' deep with an orchestra pit to accommodate a 20 piece orchestra. 2,000 people could be seated in the Capitol. 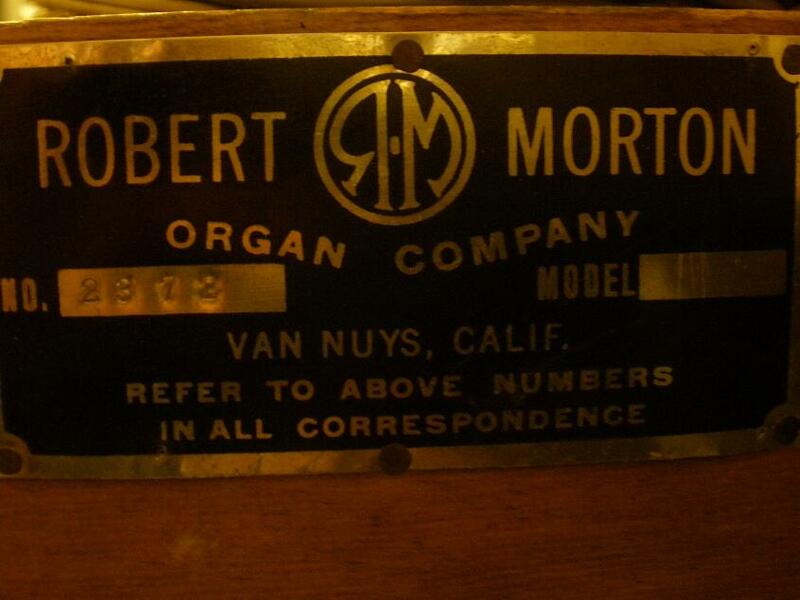 It is interesting that there is no mention of an organ on opening day, but since the Robert-Morton organ is a 1927 model, it must have been installed later. 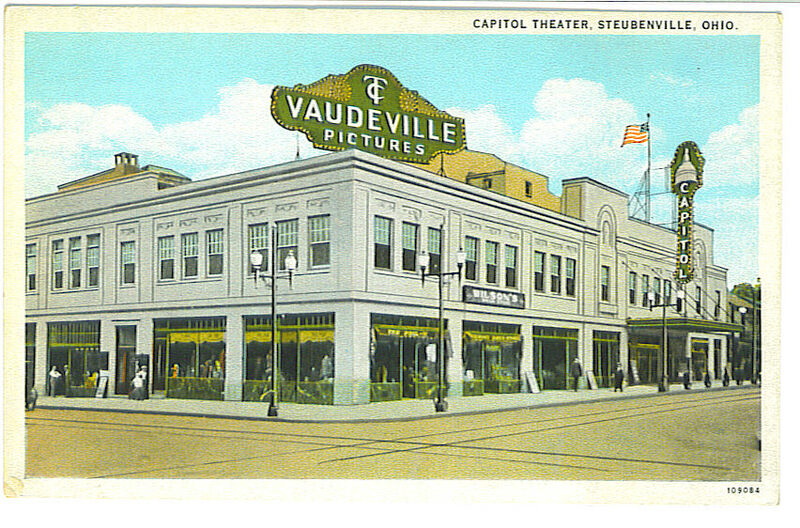 The Capitol Theatre at 4th and Adams Streets was owned by the Populias-Constant Chain, also called Tri-State Amusement or Steubenville Amusement. The Olympic and the Strand were also their theatres. The Olympic had reruns from the Capitol or cowboy shows featuring Tom Keene or Johnny Mack Brown. The Capitol had a large marquee over the ticket booth and a lovely carpeted lobby. After entering the Theatre, it was a question of upstairs or downstairs to watch a fine Warner Brothers movie. The seats were plush and comfortable. 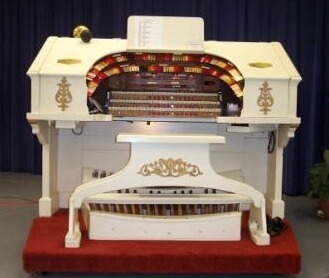 Gene Krupa played the big Morton organ when it was first installed, later Hazel Simpson was the organist. In the 1930s, nearby Pennsylvania passed the "blue laws." Theatres in Pittsburgh were closed on Sundays and the stage shows booked over the weekend at the Stanley would play Steubenville on Sunday. When Swing swept the land in the mid-1920s, the Hep Cats loaded the Capitol to see and hear Benny Goodman, Artie Shaw, the Dorseys, or Jan Savitt. Many of the "biggies" booked in here like the aforementioned as well as Glenn Miller, Chick Webb, Cab Calloway, Duke Ellington, Bob Crosby, Horace Heidt, Sammy Kay, and Freddy Martin. By the 1960s the big Capitol Theatre had lived past its prime and people remembered the big Morton organ covered most of the time. In 1970, the theatre closed and the new multiple screen theatres opened in the shopping center. The building was demolished to make way for a Goodyear Tire and Auto Center, now also closed. Interestingly, the parking lot of the former tire center has begun to sink showing what are likely the outside walls of the Capitol Theatre.